5 bedrooms 5 1/2 baths. Sleeps 14 easily. There are 5 bedrooms each with their own garden bath. The Master has a king bed , walk in closet, double shower, Jacuzzi private balcony over looking the beach and the ocean. Bedroom #2 has a king bed and its own private attached garden bathroom. It is right off the pool with a view of the ocean. Bedroom #3 has a king bed and it's own garden bath and a right off the pool with a view of the ocean. Bedroom #4 has 2 queen beds and a garden bath. Just steps from the pool with a view of the ocean. Full kitchen, stocked with dishes and cookware. The dinning and living room area Rustic furnishings from Guadalajara bring the fresh Mexico feel to life. We have a private chef that can cook Breakfast and dinner for you. Local favorites served family style. You can let us know if you have dietary restrictions. Or you can cook for yourself, everything is there that you will need besides a trip to the grocery store. There are two restaurants that are with in walking distance of the Villa. The Buffalo is right next door and a stroll down the beach is 1535. We have two on top sea kayaks that you can use included with the rental of the home. We have 2 stand up paddle boards that you can rent by the day. Check in after 2 pm, check out before 10 am. The beach is the real draw here and the house is a bonus, . . . a wonderful bonus! We have been coming to the Baja for years. We loved the area and remember one of our first flights to the nearby Punta Pescaero. There is where we fell in love with the people, the Sea of Cortez. When this project was developed were were awestruck by how beautiful the bay was. This property is unique because of it's peaceful location. It is far away from the crowds. Sometimes when you are on a stroll down the beach you might find you are the only one there. The furnishings are delightful, really Mexico and made for comfort. I love to sit on the patio by the pool under the shade palapa to view the ocean and feel the breeze. To be able to have your own home on the beach with your own private pool in such a tranquil setting is unprecedented. Leave the crowds behind and renew yourself with a visit to Villa Mirasol. There are 5 and a half bathrooms. The 5 full bathrooms are attached to each bedroom. So each bedroom is considered a suite. The half bath off the living is great to use as a pool bathroom. The bathrooms all have nice towels, and bar soap is provided. We have found everyone loves their own shampoo so most guests bring their own. The full baths each have a mini garden or large hand painted pots as a visual garden . Gran Suenos has a 24/7 guarded gate. It has a golf course (currently closed) and a restaurant. Tell my friend Teddy hi as you get a meal or a cold drink. He will even bring your lunch to the beach! San Juan de los Planes is the nearby village. You can walk on dusty roads, buy a cold drink at the little Mercados and see a small old Catholic Church off the square. Shop at a few small stores. You can see the beach from the pool, house and all of the bedrooms have a view. The only thing between the villa and the Sea of Cortez is sand. You can snorkel, Deep Sea Dive, or go Sport Fishing. Villa Mirasol sits right on a dune on the beach. The only thing between the villa and the Sea of Cortez is sand. Wonderful white sand beaches. Calm surf is family friendly. Uncrowded beach. There is a view of some small mountains at a distance behind Villa Mirasol. These Mountain hold the old silver mines that used to be active in years gone by. Wonderful view of the ocean, the sea of Cortez from pool, patio and balcony of the house. 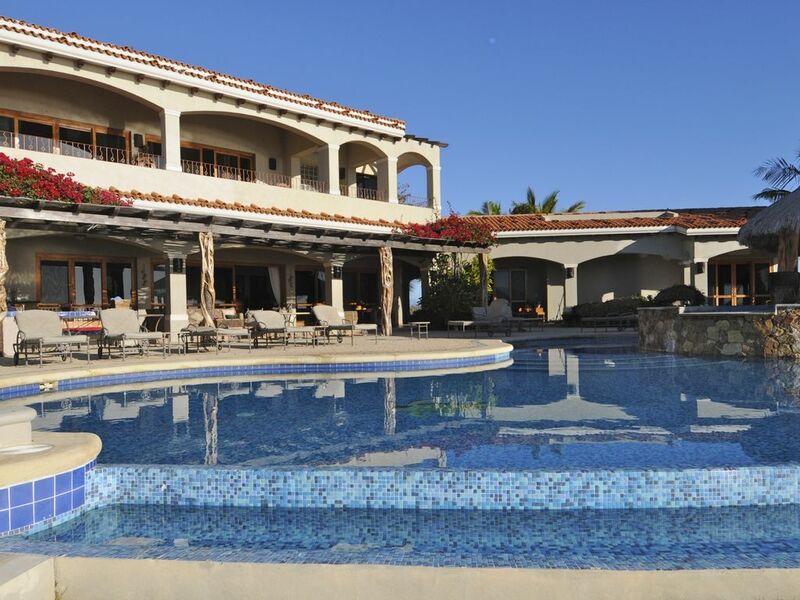 The villa is on a sandy beach on the Sea of Cortez, in Bahia de los Suenos. Quiet place for a tranquil visit. Right on the Sea of Cortez. Villa Mirasol is in a Bay. So it is calm waters. Each room has it's own control for air conditioning. We just ask that you live "green" and close all windows and doors while it is in use. Laundry service available. Ask Sergio and the staff will wash clothes for you for a tip. We can wash a load of clothes for you Just ask Sergio for details. Plenty of parking no charge, even motorhomes and boats. Space to store fishing equipment. satellite internet is available for your use. It is a little slower than you might be used to, but hopefully you are at a slower pace on vacation. There is also Wifi by the pool. There are fresh white towels in the bathrooms. We have orange striped pool towels for your use by the pool and beach. We have a shared work out room in walking distance. Just let Sergio know that you want to work out and he will help you get access to the Equipment. Living room with couch and entertainment system with dvd player and music system there are speakers in the palyapa by the pool. Just bring your I phone we have a dock to play your own music. 6 burner Wolf gas stove with a griddle makes cooking wonderful. Drinking water and coffee for the morning cup. Basic spices for cooking. all the dishes and utensils you need. Beautiful ceramic dishes for dinner. Everything you would need to cook.. Wine glasses, plastic plates and cups for use near the pool. Kids plates and cups. Fantastic distressed alder kitchen with a view of the ocean. There is a full size fridge, lots of kitchen pans anything you would need for cooking. There are a variety of beautiful dishes. There is a large deep freezer for your fisherman to put their catch. Wonderful dinning table to seat 12 in the dinning area adjacent to the kitchen. You can eat in the shade of the Palyapa, in the sea breeze, where we have assorted tables and chairs. Large screen TV satellite service. We get some channels in English. DVD player with both televisions. in the Master Bedroom and the living room. Random collection of paper back books. Take one leave one. Next door at the Buffalo restaurant. Some pool toys are on the shelves at the bottom of the stairs. You are welcome to use anything that is there. We have about 20 DVD's in the drawer for guest use. There are gardens surrounding the pool, with bougainvillea & other lovely indigenous plants. There is no grass, as water is a premium in the desert. We are on the dune so sand is right by the pool. Large balcony off the master suite to sit and read as you look over the ocean It has a table and chairs for you to use. 2 on top sea Kayaks included with rental of the villa. I can arrange for a local fisherman to take you Deep Sea Fishing, Spear fishing, Free diving, Snorkeling and Deep Sea Diving. You can reserve ahead or check for availability when you arrive. The patio has a couch and chairs to sit and chat in the shade. Then around the pool there are 8 chaise lounge chairs for sunbathing. 2 Stand up Paddle boards available for rent. Discounted for guests. There is a wonderful golf course steps away. Unfortunately it is closed at this time. We will let you know when it reopens. The pool is the feature the Villa is built around. Clean and clear just for your group. Hand tiled swimming dolphins and turtles decorate the pool. From the pool you have view of the beach. Relaxing hot tub great for end of the day star gazing. New electronic controls for simplicity turn on and off with one touch. Villa Mirasol house manager, Sergio will greet you and help you settle in when you arrive. He will help you with any questions you may have. He will give you his cell phone number so that you can text him any time. You will need at add the WhatsApp to your phone. This is the best free option for texting internationally. He will work to make your stay enjoyable. This location will exceed all expectations and the house and staff are phenomenal. We had a full crew of small kids, 3 couples and a teenager - everybody loved it. Total success. We had a glorious stay at the Villa Mirasol. It's a huge house, much bigger than it appears in the photos. 5 big bedroom suites and a very comfy living room area. The views from the property are incredible, it overlooks a beautiful, empty beach which has good snorkeling on the right hand side. Lots of things for the kids to do, there's a ping pong table and a restaurant next door that has shuffle board and pool tables. The staff are lovely, very helpful and friendly, the house keeper's wife and sister made us very high quality, delicious breakfasts and dinners. The swimming pool and hot tub were also fantastic. We loved the set up for having a fire on the sand, and sat outside one night and watched the incredible stars. Tons of thoughtful little touches, they've really thought of everything! The only downside were the mosquitoes, but we kept all the doors shut which helped and they provide lots of bug spray. All in all, a fantastic place to rent, we will definitely return! The photos do not do this place justice. The property is just over-the-top beautiful. It is secluded. The view from the patio, over the pool, down the beach, to the ocean, is breathtaking. And you have it all to yourself! Actually, there is a wonderful bar next door, but we didn't even notice it and didn't know it existed until 3 days in to our trip! And that was only because one of my friends wandered off to explore. The villa was very comfortable - each room has it's own entrance, bathroom, and air-conditioning. It was so hot during the week of our stay, but we spent everyday alternating between the pool and the ocean. We couldn't have asked for better house staff. We were not expecting the service they provided. YOU WANT THEM TO PREPARE MEALS FOR YOU. This is not a place to pinch pennies. The house is kind of far away from everything. If we hadn't opted for the meals, we (16 adults) would likely have been eating chips for 5 days. The meals were DELICIOUS - homemade Mexican food doesn't get any better. They even made us lobster one night. And made dessert every night. Sergio, the house manager, was the perfect balance of being present but out of the way. He was always there when we had questions or needed anything (like more beer - he drove out to the store for us! ), but never imposed. He made sure to check in with us daily to ask about our plans for the following day. He communicated with Palapas Ventana, the sea adventures company, for us. Palapas Ventana came and picked us up at our beach to take us snorkeling for a day! Sergio also helped a few of us set up horseback riding. He asked if we'd be interested. We said yes! On the chosen day and time, 3 men showed up to our beach with 3 horses! As indicated in my subject line, MIND BLOWN. One hang up about the villa were the directions getting there. Google maps doesn't quite know where the property is, though it gets you most of the way there. Once you get beyond entrance of the community, you're driving down a sandy, windy road that has lots of unmarked forks. Maybe both sides take you to the same place and it doesn't matter? The other minor thing - for some reason, use the kayaks was free, but use of the paddleboards was pretty darn expensive. It's a silly detail, but strange. Just can't imagine why this would be. 99.9% AMAZING. We have all promised to go back, hopefully on an annual basis, for our Villa Mirasol Reunion. This was my second trip and wow it was better than the first. Great spot to have a wedding with all family and friends. The beach and sand perfect. The pool always clean and the hot tub soaked away a soothing day in the sun. You can take snorkel trips or go right out in the bay, tons of coral and tropical fish. For the adventurers out there try a day out fishing for Marlin. I caught a trophy fish 2nd week of May. The fishing is great. The staff is awesome, food even better and with air conditioning, WiFi and satellite TV you will feel at home when the sand gets washed off in the 5 full bathrooms. I will pay for many many more trips here, favorite spot in Mexico! Thanks for taking the time to review your Villa Mirasol experience. Our staff was so happy for you and your wonderful wedding there on the dune overlooking the sea. We are so glad you enjoyed your time there. The marlin you caught was amazing! We would love to have you return anytime. What a stunning setting! We couldn't have asked for a better place to spend our vacation. Kids were entertained by the pool, hot-tub, beach, sand, and fire-pit. Surprised to find spectacular snorkeling just off the beach including coral and all sorts of tropical fish. Chartered a fishing boat which picked us up right at the property. Chef America and Vicky cooked for us a few times (they also bought the groceries and did the dishes!). Sergio took good care of us and even made a couple trips to the store to pick up a few things we needed. Secluded, quiet location but still walking distance to two restaurants. We will be back. The anorkleing is great! Glad you took advantage of that. We would love to have you return anytime! Our stay at Villa Mirasol was a dream. We have never been on a more fun, relaxing, exhilarating, vacation. From snorkeling, walking on the (empty) beach, to catching a 35 pound Dorado on the Sea of Cortez, the vacation made us want to return again and again. Photos cannot do the idyllic setting justice. With two great restaurants close-by and the option of in-house cooking (my recommendation), Villa Mirasol leaves no detail unattended. We will return as soon as possible! Thanks for taking the time to write such a wonderful review. We enjoyed having you visit. We would love to have you return. Villa Mirasol resides in the Bahia de los Suenos gated community. Apart from the hustle and bustle quiet and tranquil. Mirasol is right on the beach. It is a place to relax. The waters are calm, with a little surf sometimes. We can help you book Deep Sea Fishing, a day snorkel trip to the island or learn to Free Dive and Spear Fish. There is an old Spanish Dock at the end of the Bay that you can walk to. It has the remnants of days gone by when the Spaniards were mining Silver at Bahia de los Muertos. Breakfast overlooking the beach just got better. When you book your vacation for Jan, Feb or March, just mention 'free Breakfast' and our Chef will prepare a luscious breakfast for your entire group on your first morning at the Villa.